This simple white cake recipe is so straightforward that a beginner could make it in a pinch. 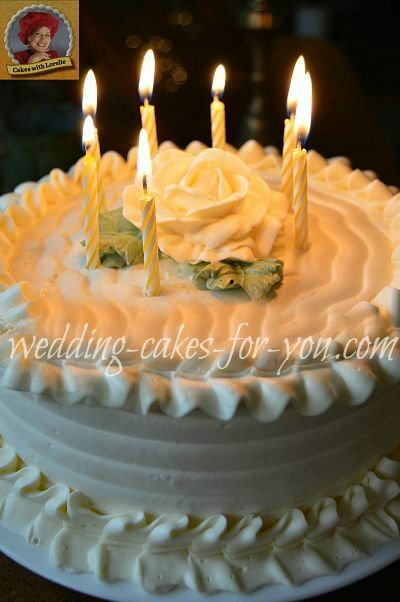 Professional bakers and pastry chefs will also appreciate this versatile and absolutely elegant white birthday cake recipe, which of course can be multiplied for a wedding cake. I personally was VERY impressed with these layers of yummy-ness, which is why I included it here in my collection of winning recipes. The feathery white cake (above) is iced and filled with a Swiss meringue which consists of unsalted butter, sugar syrup, egg whites, and a touch of salt, and vanilla or almond. I beautified my sample cake above with a buttercream rose. A simple yet pretty decoration. I talk you through the recipe and method in the video. This will make two layers each 8 or 9 inch pans or 2 dozen cupcakes. NOTE: Bake your layers for 27 -35 minutes or until they are firm enough to the touch. The cupcakes take less time. Check them after 12 minutes and then set the timer for 5 minutes and recheck. They still may need a few minutes more, but it will depend on your oven. You could also use the toothpick or spaghetti trick. Put the toothpick in the center of the cake or cupcakes and if there are no crumbs on it then the cake is done. ﻿Prepare two 8 inch or 9 inch pans with shortening and a dusting of flour plus waxed or parchment paper lining. Start with your dry ingredients, placing them all into the mixing bowl with the mixer on low to blend. Add the milk and the vanilla or almond and the 1/2 cup of shortening. Blend on low speed until moistened. Gradually bring the mixer speed up to medium high and beat for 2 minutes. Add the egg whites and mix on low to incorporate them. Raise the speed to medium high and beat for 2 minutes. Split the batter between two 8 inch pans. Details are in the video for preparing and filling your pans. Bake 25-35 minutes or until the cakes spring back to the touch or a toothpick stuck into the center comes out clean. 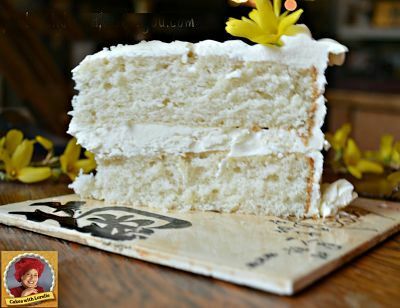 Enjoy this simple and delicious White Cake Recipe! With this type of cake I like to use lightly sweetened icing such as a Swiss meringue buttercream. You can take that basic buttercream and add flavorings to it to make a delicious filling. The combinations are endless for a simple white cake recipe like this. I will give you some ideas then feel free to experiment with your own creativity.